A complete Social Relationship Platform (SRP) partner provides a unified platform for engaging audiences, activating customers, and driving business results across all social channels. More than just monitoring, a SRP enables planning, listening, engaging, coordinating, measuring, archiving, and integrating with other business applications. These capabilities are essential to create an effective enterprise social media presence. 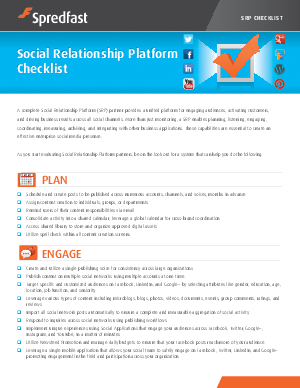 Download and learn the 12 ways to evaluate a social platform relationship partner.